Castle House Inn, Sztokholm, Szwecja : Rezerwuj teraz! 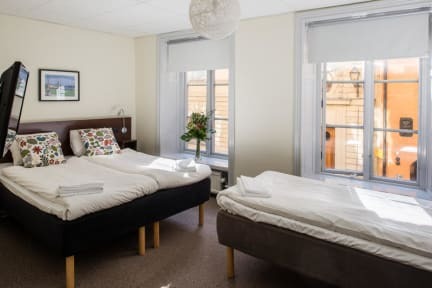 Castle House Inn is located in a 18th century building in the very centre of Stockholms ancient Old Town, only two minutes away from the Old Town metro/subway stop. The Royal Palace is only one block away and so is the Cathedral, the Nobel Museum, the harbour and the ferry boats for Djurgarden. Local shopping, restaurants, coffee shops and boutiques are found immediately outside the hotel on the historical steets and alleys of mediaeval Stockholm. Castle House Inn, however ancient is fully renovated with top modern rooms with private or shared facilities. 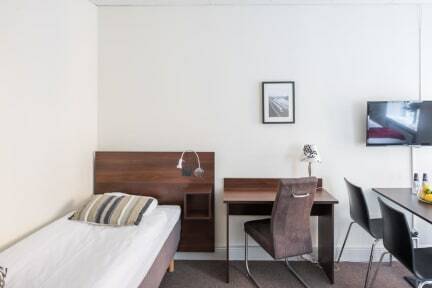 All with free high speed wifi and on prime location in the Old Town of the Scandinavian Capital. Minimum age for staying at Castle House Inn is strictly 21 years of age. Maximum age for staying in shared dormitories is 40 years of age. Cancellation policy: Free cancellation until 48 hours prior to arrival. Payment: By cash or credit card. The property may pre-authorise credit cards prior to arrival. Name on reservation, credit card and ID/passport must match. Check in is possible from 14:00 until 21:00. Check out no later than by 11:00 am. Security screening apply for all arrivals and a fully prepaid reservation is required. Late arrivals after 21:00 are unfortunately not accepted. There also need to be a valid and fully chargeable credit card on all reservations. Taxes are included. Breakfast is not included. Property is non-smoking. Free cancellation up until 48 hours before booked arrival. Payment is possible by cash and credit cards. The property may pre-authorise the credit card prior to arrival. Check in from 14:00 to 21:00. Reception is open until 21.30. Late arrivals after 21:00 will unfortunately not be accepted. Check out no later than by 11:00 am.